Givenchy: foundation compact & liquid ($25 with box, $20 refill), quad highlighter, quad sculpting powder, blusher (powder/cream), quad eye shadow palettes, lippies, nail lacquers, didn't check individual prices but all between $10 - $25 range. Few skincares available also. 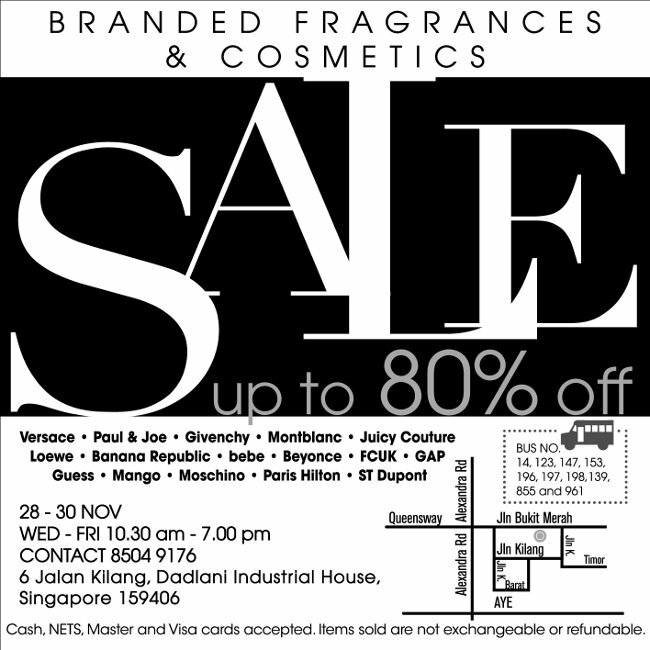 Fragrance: all the brands listed in the poster are available and priced ~$30 for prestige brands or ~$10 for other brands. I didn't buy anything though... took a few P&J stuff as they quit Singapore market already but the queue for payment was too long so I just forget about it. Anyway I went to the sale last year and things I bought then are still lying in my stash... (except some anti-aging Givenchy skincares I gave to my mom=p). OG offers 20% off storewide from Nov 29 - Dec 2. Maybank credit card members can enjoy extra 5% off! Ariva Skincare offers free $20 gift card with any $99 purchase. No code needed. Enter thru link to add the gift card to your cart. Valid thru Dec 1. Beauty.com offers a free L'occitane Immortelle Precious Cream deluxe sample ($17 value) with any $10 purchase. No code needed. Enter thru link. While supplies last. Beauty Collection offers free Nuxe 'My Beauty Kit' with any $50 Nuxe purchase. No code needed. While supplies last. Benefit Cosmetics offers free deluxe minis of They're Real! Mascara & Sugarbomb with any $50 purchase. Enter code LILSUGAR at checkout. Valid thru Dec 6. Bobbi Brown offers free exclusive set with any $100 purchase. Enter code DELUXE1 at checkout to redeem the Holiday Eye Palette Set, or DELUXE2 to redeem the Sunrise Lip Gloss Palette Set. Valid thru Dec 2. Clinique offers free 5 minis of your choice with any $30 purchase. No code needed. Valid thru Nov 30. Dermstore offers WunderBrow (u.p. $61, 51% savings) for only $29.95 + a free gift with purchase. No code needed. Valid thru Dec 5. Fragrance & Cosmetics Co. offers free 3-pc Korres gift set with any $75 purchase. While stocks last. La Mer offers free shipping and a deluxe sample of Oil Absorbing Lotion with any purchase. Enter code RADIANCE at checkout. Valid thru Dec 24. Molton Brown offers 25% off sitewide Friends & Family Sale. Enter code FESTIVE5 at checkout. Valid thru Dec 2. Plus receive free 30ml mini MB bottle + free gift box on any purchase while supplies last. Philosophy offers free 15% off sitewide. Enter code december15 at checkout. Valid thru Dec 3. Pur Minerals offers 20% off sitewide. Enter code HOLIDAY20 at checkout. Valid thru Dec 1. StriVectin offers free travel size StriVectin-SD Intensive Concentrate with pre-order of StriVectin-AR Advanced Retinol Night Treatment. Sign up through link by Nov 30. Time to Spa offers Buy One Get One 50% off sitewide. Enter code SAVE50 at checkout. Valid on Nov 29 only. Urban Decay offers a mystery travel bag for $16. The bag is filled with over $45 of UD products and is TSA coveted and approved. While supplies last.